As the devices we use to access the web continue to diversify, with all manners of capabilities and screens to support, the need for responsive websites has never been so important. Sixmile Design now specialises in the design, development and build of responsive websites. The notion of of responsive web design (also known as adaptive design) is a simple concept: creating websites that seamlessly respond to the user's environment, based on the device, size, resolution or technical capability. In simple terms this means the website will display, as intended, whether viewed on a desktop PC, laptop, iPad, tablet or smart phone. With so many different sizes of devices on the market this is no tall order. In technical terms this means a new way of looking at and structuring the source code of a website and, in particular, new css (cascading style sheet) rules. These new css rules/media queries are of particular importance as they determine the styling of the website whether viewed on a large or small device. Overall this represents a new way of building websites, a way not every website developer has taken on board. But why bother? - Let me answer that with a question. Have you ever had to pinch, squint, zoom in, miss the intended button and swear while viewing a website on a mobile device? Yes? Then you're not alone. 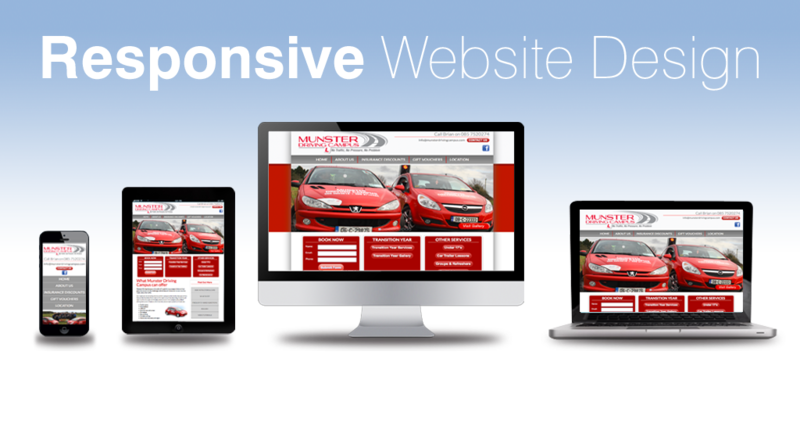 The primary benefit of a responsive website is that the site is 'optimised' for a mobile device. These problems are consigned to the past. The danger of a web developer not implementing a responsive design is that the mobile viewer may move onto a website that is optimised for mobile. And there are a lot of people (customers) viewing on hand held devices. There are of course SEO (Search Engine Optimisation) benefits to a responsive website build as well. Google's help page on "Building Smartphone-Optimized Websites" recommends a responsive web design above other approaches. They suggest that a single URL helps Google assign indexing properties for the content, load time is reduced because no redirection is needed, and it saves resources for your site and Google's crawlers. These can certainly help your site rank higher in the search results. For most us, what really matters is how well our website converts. By this I mean how someone viewing your website will 'convert' into a paying customer. Thus by utilising responsive website design to increase the focus on smartphone and tablet users while still addressing desktop users, the overall conversion rate for your site will likely increase.